Leaner Tip: Substitute sushi rice with sliced cucumbers to reduce recipe by ~150 calories per oz. Peel and remove the skin of the cucumber. To make the sushi roll wraps, peel the cucumber vertically from one end to the other to create a thin ribbon like cucumber slices. Repeat the process until you start to see the cucumber seeds,then stop because cucumber slices will break apart. So then peel from the opposite side of the cucumber. To make the spicy tuna, dice the tuna and mix in 2 tsp of sriracha sauce. 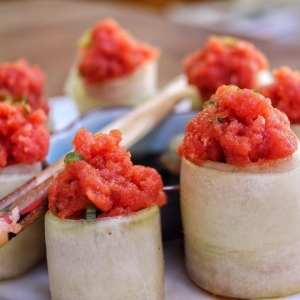 Scoop a small spoonful of the spicy tuna on one end of the cucumber ribbon slice, roll up, and repeat until you’ve create about 10-15 spicy tuna cucumber rolls. Serve with soy sauce.